Formula Junior spec 5-port cam kit originally developed by Russell Engineering for the small-bore engine range to give strong torque curve from lower than normal rpm for a race engine and still produce tremendous peak power. Unusually for a small-bore, higher lift rockers give even more performance. CST3007 1.4:1 ratio rockers strongly recommended. Astonishing results in large bore engines too, particularly short-stroke, large-bore variants (i.e. 1071 types and short stroke 1300). 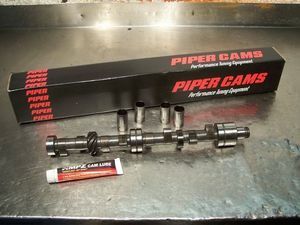 Kit contains cross-drilled camshaft blank, race spec cam followers, cam lube, valve springs and installation instructions.